1) Will this matter ten minutes from now? 2) Will this matter ten months from now? 3) Will this matter ten years from now? When faced with a crisis, a dilemma, or a situation in which we are being asked to make a decision or take action, too often we focus on the immediate. Thus the reason for the first question-Will this matter ten minutes from now? For me, the first ten minutes often represents all the immediate fears and perceived worst-case scenarios. Will this matter ten minutes from now? Of course, because you panic about all the what's-- What am I going to do? What am I going to say? What will people think? What will they say? What will they do? What will happen next? Yet, fast-forwarding time in your mind a bit can give you a different perspective. Will this matter ten months from now? This question helps you to imagine the after effects. After the decision is made, what will the fallout be? After an action is taken, what might be the intended and unintended consequences? After ten months, how will my life or the lives of those involved be changed? The last question gives the clearest indication if this is something really worth your energy, worry, doubt, trouble and time. Will this matter ten years from now? If it will matter ten years from now, then perhaps a good deal of prayer, discernment, and faithful action is in order. However, if it will honestly not matter ten years from now, perhaps the best course of action is to let it go and move on. Or, at the very least, do not let it rob you of valuable time and energy in the present moment. I believe the 10-10-10 rule was not unique to Suzy Welch. For this wisdom can be heard in the words of Jesus himself as recorded in the Gospel of Matthew, chapter 6, verses 25-27, 31 & 33 "Therefore I tell you, do not worry about your life, what you will eat or drink; or about your body, what you will wear. Is not life more than food, and the body more than clothes? Look at the birds of the air; they do not sow, reap, or store away in barns, and yet your heavenly Father feeds them. Are you not much more valuable than they? Can any one of you by worrying add a single hour to your life? So do not worry, saying, 'What shall we eat?' or 'What shall we drink?' or 'What shall we wear? But seek first the kingdom of God and God's righteousness, and all these things will be given to you as well." Our first ten minutes worries are as akin to the worries of what we will eat, drink, or wear. They only address the immediate, often shallow concerns, looking for quick fixes and easy answers. As can also be true of our ten-month concerns. Yet, ten years' concerns (if it will matter in ten years) signify the things that really matter in life-our relationships, our character, our core values, opportunities to make a difference in the world or to authentically live out the life to which we have been called as people of faith. This is kingdom building. The truth is: true kingdom-building living requires us to stop and prayerfully take the long view, seeking God's wisdom and counsel before making quick decisions that only concern and affect the immediate. 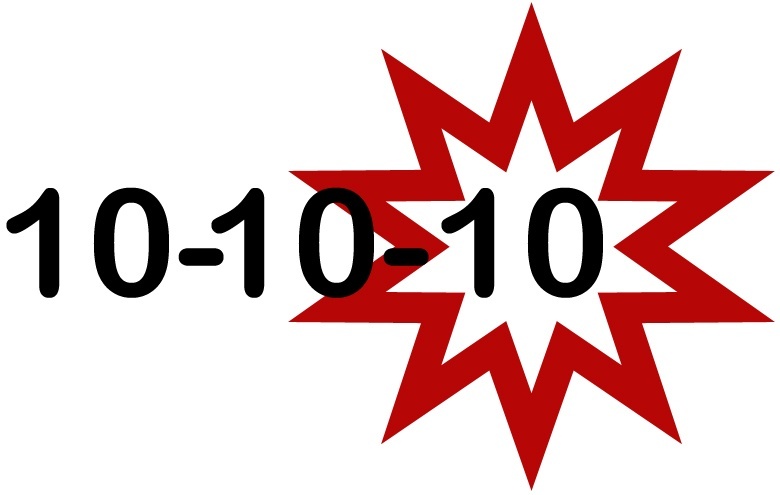 The next time you or your church is faced with a dilemma, crisis, or decision that needs to be made, I encourage you to use the 10-10-10 rule. Stop and ask the important questions; take the long view; seek the counsel of the Holy Spirit; and challenge yourselves not to be reactionary, but rather committing to doing kingdom building.